Whenever there’s a con, I try and get together with some friends and doa combined bits order. We get to snag whatever odd things we need to repair models, and we get to order some of the awesome, limited edition models that Privateer Press makes available. Not only is he a fun alternate sculpt, but he’s one that gives a nod towards one of the often disregarded (by manufacturers and event organizers) and my favorite part of the wargaming realm: the hobby. Of course, I ordered one. So, let’s have a look at what comes in the blister! So, the resounding opinion on the blue and off-white is that it’s cool, but not quite as inspiring as the Aquablight, and I agree. It wasn’t difficult to paint, and isn’t too detailed either. It wasn’t terribly *fun* to paint. An interesting distraction, but nothing more. So, those shredders will forever be a fun experiment, but nothing more. For reference, here’s the Battlebox I painted roughly a year ago. Speaking of, here’s the recipes I ended up using on this new Lylyth model. Most of the blends were 2-brush blends, but the white on the hair pins, arrows, trinkets and bow were glazed. The new Lylyth, Herald of Aquablight! Had to work in Brass somehow… This *is* a steampunk setting, afterall. The cape came out particularly well, I think. About a week ago, one of the Privateer Press Insiders covered testing color schemes in cyberspace. Lane Daughtry, in her Insider, describes almost the same process that Captain Spud of Lost Hemisphere did over a year ago, using layers and settings in Photoshop to essentially make a “coloring book”. Anyway, the color schemes Lane tested out on her Angelius look great, and one of them really grabbed my attention. The blue and off-white one just really struck me, and took hold in my mind. So, I had to try it. Shredders make quick test subjects! I used Cygnar Blue Highlight as the basecoat, and shaded down with Cygnar Blue Base. I used Arcane Blue for the “blight” on the gums and the spine. The gums were shaded with Turquoise Ink, and then picked out with Arcane Blue. The spines and scales were Menoth White Base -> Menoth White Highlight -> Morrow White. Ladyzoid likes the blight along the spine. Do you? While these are quick test models, I think they came out pretty well. I think the white may need to be toned down some, and I need to find a highlight color for the blue. I also think the blending could be better, but provided I did these while sitting on the couch in front of the TV and with no real light source, I’m OK with it. 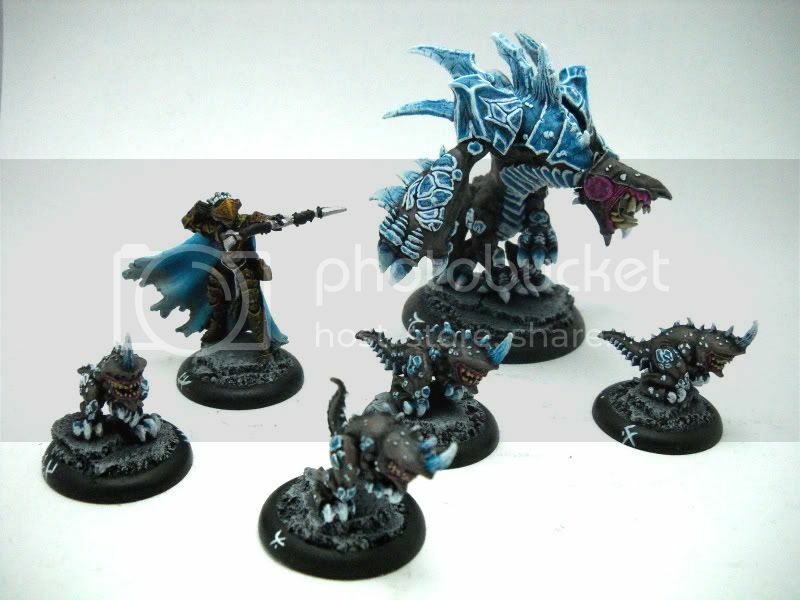 Do you like it more or less than my Legion of Aquablight scheme? You know, now that I get the two scheme side by side, I’m not sure which one I like better. I do know though, that the Aquablight scheme has to change. It was done with old GW paints which no longer exist, so I’ll have to figure out how to do it with P3 paints.